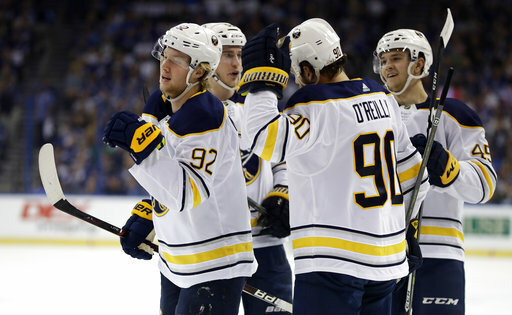 Do you think it was easy to cover the Buffalo Sabres during the 2017-18 season? Think again. It wasn’t easy to come up with new ways to describe the team’s latest losses for the last-place team. One angle that did come up every so often was the way the Sabres played at home – which is to say, terrible. Buffalo only picked up 27 points at the KeyBank Center, one of the worst such seasons in team history. The reporters would ask the players what the problem at home was, and they’d try to come up with answers. The Sabres were trying too hard to entertain the home crowd. They were grabbing the stick too tightly (a kind way of saying that nerves were involved). And so on. I tried not to get caught up in that discussion for a reason. My theory is that such numbers are a matter of luck. Let’s look at the home/road record comparisons, going from the biggest home-ice advantage to the smallest in 2017-18. HP stands for Home Points, RP stands for Road Points. Team – HP – RP – Diff. The Sabres, then, were tied for last in the category, with Calgary – which had a mediocre 37-35-10 record. Let’s see – Pittsburgh was in the top five both years, while Calgary was in the bottom five twice. If you are curious, the Sabres had 46 home points in 2016-17 and 32 on the road. My guess is that teams will reach the proper level in the standings over the course of a season, but the breaks might not even out when just considering home or road games. Odds are good that Buffalo will bounce back next season to have more points at home than on the road. The tough part will be to predict just how many total points they will have next April.